A revolutionary transformation of the entire global monetary system is currently underway, being driven by an almost perfect storm. The implications of this transformation are extremely profound for U.S. policy in the Middle East, which for nearly the past half century has been underpinned by its strategic relationship with Saudi Arabia. Once energy producers became aware of the U.S. economic dependence on low-interest rates, they understood that they would never again be able to regulate the price of oil relative to U.S. treasuries. Anything more than a nominal hike in interest rates would effectively implode the global financial system, as the U.S. had become too financialized. The petrodollar system, which had allowed the U.S. dollar to replace gold as the backing for the oil trade from 1973-2002, was essentially broken. With no regard for the underlying systemic weakness of the entire petrodollar system the U.S. began to rely heavily on economic sanctions as a means of forcing geopolitical capitulation. It was virtually inevitable that potential targets of such actions would eventually attempt to mitigate these hegemonic actions by the U.S. 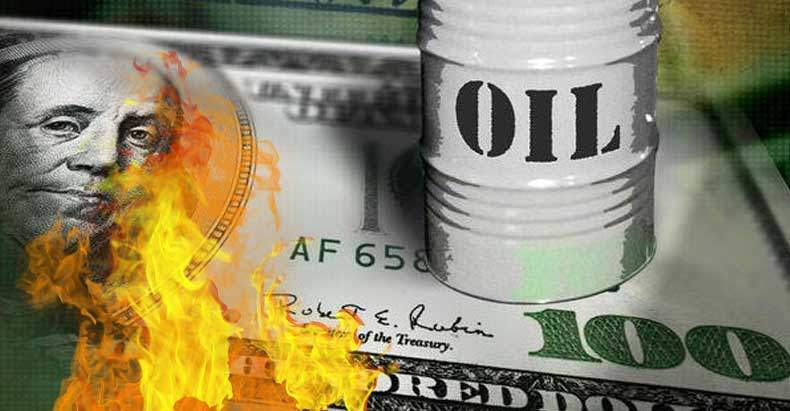 Although essentially a response to the aggressive posture of the West, these economic actions have potentially created an environment ripe to put the final nail in the coffin of the petrodollar. In the greatest of irony, central banks from states such as China, Russia and Brazil, which vehemently oppose an interventionist U.S. foreign policy, ultimately finance the U.S. war machine by purchasing U.S. Treasury debt as a means of protecting their economies. But in what appears to be an effort to hedge against U.S. imperialism, both China and Russia have become big buyers of physical gold. Russia’s present gold reserves would back 27 percent of the ruble money supply, according to the Huffington Post. That ratio is far in excess of the U.S. Fed’s original stipulated gold coverage minimum, as well as in exceeding that of any other major country. In addition, Russia is typically is a net exporter of goods and energy, so their gold reserves are likely to continue to increase. China ended years of speculation about its official gold holdings by revealing an almost 60 percent jump in its reserves since 2009. The country’s central bank said its gold reserves were 1,658 tonnes (53.31 million fine troy ounces) as of the end of June. In April 2009, reserves were 1,054 tonnes. The purchases show how China is seeking to diversify its reserves away from the US dollar at a time when the price of gold has fallen to near its lowest price since 2010. “In 2014 Russia and China signed two mammoth 30-year contracts for Russian gas to China. The contracts specified that the exchange would be done in Renminbi [yuan] and Russian rubles, not in dollars. That was the beginning of an accelerating process of de-dollarization that is underway today,” strategic risk consultant F. William Engdahl writes in his article for New Eastern Outlook.